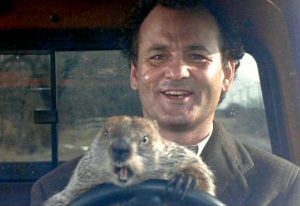 Content marketers: still having Groundhog Day moments? It’s Groundhog Day! Remember the movie of the same name, where Bill Murray, as an arrogant weatherman, is forced to live the same day over and over again? Seems to me that’s often how many marketers experience the development of thought leadership content. Seems to me that’s often how many marketers experience the development of thought leadership content. (Hah! Just seeing if you’re paying attention…) They keep encountering the very same challenges, project after project, month after month, year after year. The story idea hasn’t been vetted. This comes up as surely as night follows day. Hard-charging authors are smitten with their ideas and the story they want to tell. They roll right over hesitant marketers, and the untested ideas get jammed into content pipelines. Nobody has checked the ideas for purpose – how they will benefit the organization. There’s been no pushback considering what competitors have recently produced on the same topic. Nobody has pressure-tested the claims made, or required examples or fresh data in the story. No one has asked why it has to be a lengthy, costly report when it could be a quick, low-cost article. How to snap out of Groundhog Day: Have a formal vetting process for story ideas. Circulate it. Communicate it to all potential authors. Enforce it. Practice it until it becomes The Way Thought Leadership Happens. The expert just wrote up her story because she’s a good writer. Um, she may be able to write strong proposals and client reports, but professional storyteller she is not. We see this all the time: authors who view writing as a commodity skill, so they just go ahead and “write the story.” Not only is it written like an academic treatise rather than an arresting and timely article but it is weighed down with repetition, industry jargon, and worse. In all the time spent putting finger to keyboard, the expert could have been meeting with new prospects or servicing existing clients. How to snap out of Groundhog Day: Bring in professional writing talent early – not just to edit the expert’s full draft but to engage from Day One in constructive discussions about the objective for the content and the best ways to present and support its argument. The article is a brochure in thought leadership clothing. This particular peccadillo is far more common than it should be. In the rush to the sale, organizations think they must cram multiple mentions of product or service offerings into the article or report. Problem: it’s no longer about creating reasons for fact-finding conversations with clients and prospects. You’re now pitching them from Brochure-Land. How to snap out of Groundhog Day: Be very clear about the roles played by thought leadership content versus content designed explicitly for sales support. Be sure that authors understand those distinct roles too. The senior partner is reviewing the piece – having first learned about it yesterday. Uh-oh. Maybe you’ll get lucky and the senior exec will just wave the article on through. But it’s highly likely he’ll ask why this piece and how it fits with the overall marketing campaign. He may start his own round of heavy editing – and in doing so, change the thrust of the article completely. Worst case: he may kill it. Upshot: Lots of time and money wasted. Marketing’s credibility diminished. How to snap out of Groundhog Day: Get all necessary buy-ins from the get-go. Make sure one top leader is the official sponsor of the document, even if he or she is not a named author. Keep them in the loop as much as they want to be there. There are multiple authors – but they don’t agree on the story. Ah, yes – one of the very best ways to squander time and money: get the writing team on the phone and let the experts start sounding off on what the story should be. (In one situation, we had more than a dozen experts arguing for more than an hour, without resolution.) If the call ends with no consensus on the story idea and an instruction to the writer to “just figure something out,” the best you’ll get will be the famous Horse Designed by a Committee. Followed by many more frustrating conference calls. How to snap out of Groundhog Day: Figure out, on Day One, who should be on the author team and ensure there’s absolute agreement among them – not just on the story concept but on their individual roles in developing the story. Then ask for their help in anticipating who else might end up on the byline, and resolve the issue of their inclusion ASAP. The companies mentioned don’t know they’ve been mentioned. This is a stopper for sure. Experienced marketers (and top thought leadership writers) know that client examples in a thought leadership piece may have to be cut because the company-client relationship may suffer if they’re included without permission. If these cuts happen at the eleventh hour, the article will run late, and big sections may have to be rewritten. How to snap out of Groundhog Day: As part of the early vetting process, get the authors to shortlist the clients they will likely use as examples. Start the client approval process right then and there. I could go on. And on and on. These are just a few of the omissions and commissions that we writers see all the time. But like Phil, the Groundhog Day weatherman, I want to break out of this loop and get on with my life. You should want that for your content marketing efforts too.